Serves as a foundation for undergraduate courses in American military history. 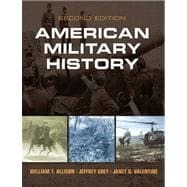 American Military History is uniquely tailored to American military history courses. Organized chronologically, the text begins at the point of European conflict with Native Americans and concludes with military affairs in the early 21stcentury. The content and style will appeal to history majors and non-majors and is designed to allow instructors flexibility in the structure of their course. Learning Goals Upon completing this book readers will be able to: Understand the central themes and events in the American military history Relate these themes to American history as a whole\ Know the issues beyond war that have contributed to the American military experience Note:MySearchLab does not come automatically packaged with this text. To purchase MySearchLab, please visit:www.mysearchlab.comor you can purchase a ValuePack of the text + MySearchLab (at no additional cost): ValuePack ISBN-10: 0205912133 / ValuePack ISBN-13: 9780205912131. William Thomas Allison is Professor of History Georgia Southern University. He earned his Ph.D. in history at Bowling Green State University in 1995, and has taught as Visiting Professor at the Air War College and the School for Advanced Air and Space Studies. He is author of Military Justice in Vietnam: The Rule of Law in an American War (Kansas, 2007), The Tet Offensive (Routledge, 2008), My Lai: An American Tragedy (Johns Hopkins, 2012), and The Gulf War, 1991 (Palgrave, 2012), among other works. He has served on the editorial board of the Journal of Military History and as a member of the Department of the Army Historical Advisory Committee. Jeffrey G. Grey is Professor of History in the School for Humanities and Social Sciences at the Australian Defence Force Academy. He earned his Ph.D. at the University of New South Wales in 1986, and has held several professorships, including the Major General Matthew C. Horner Chair of Military Theory at the United States Marine Corps University. His numerous publications include The Commonwealth Armies and the Korean War: An Alliance Study (Manchester, 1988), A Military History of Australia (Cambridge, 1990), Australian Brass: The Career of Lieutenant General Sir Horace Robertson (Cambridge University Press, 1992), 'Up Top': The Royal Australian Navy in Southeast Asian Conflicts 1955-1972 (Allen & Unwin, 1998), The Australian Army: Volume I: The Australian Centenary History of Defence (Oxford, 2006), as well as several authored and co-authored volumes on Australian military history for the Australian Army History Unit and Australian Military History Publishing. He has served as a trustee for the Society for Military History and on the editorial boards of the Journal of the Australian War Memorial, Journal of Military History, Scientia Militaria, War in History, and Australian Army Journal, and is editor for the journal War and Society. Janet G. Valentine is Assistant Professor in the Department of Military History at the United States Army Command and General Staff College, Fort Leavenworth, Kansas. She earned her Ph.D. at the University of Alabama in 2002 and has worked as a historian for the United States Army Center of Military History, the Air National Guard History Office, and the Joint History Office. She has served on the advisory board for H-WAR and the editorial board of the Journal of Military History. She taught at the University of North Florida and Mississippi State University. Her current research focuses on the Korean War, and citizenship and military obligation.